Twenty years have passed, I have already had a son, and that old dream of mine, hidden in a small shell of adulthood, embodied finally in “the Dream” — built for the son of double foot the car. First of all I want to share some of the thoughts that preceded the Creation, or rather, was accompanied by the design of this “toy”. The main feature of “Dreams”, which primarily catches the eye, the most actively discussed with passers-by and delighted with the boys all around her “dvuhmestnoe”. And this is no accident. 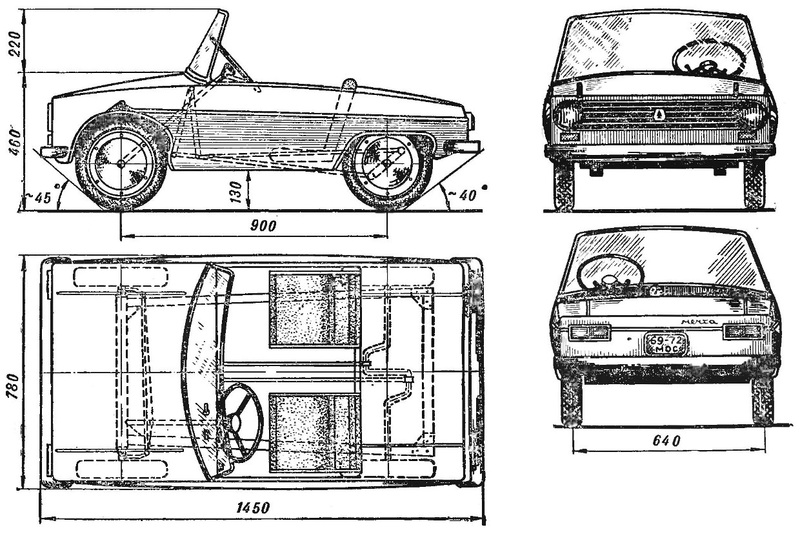 Double layout allows you to make the car’s proportions are more natural, although, of course, slightly increases its dimensions. Fig. 1. General view of the double pedaling car. 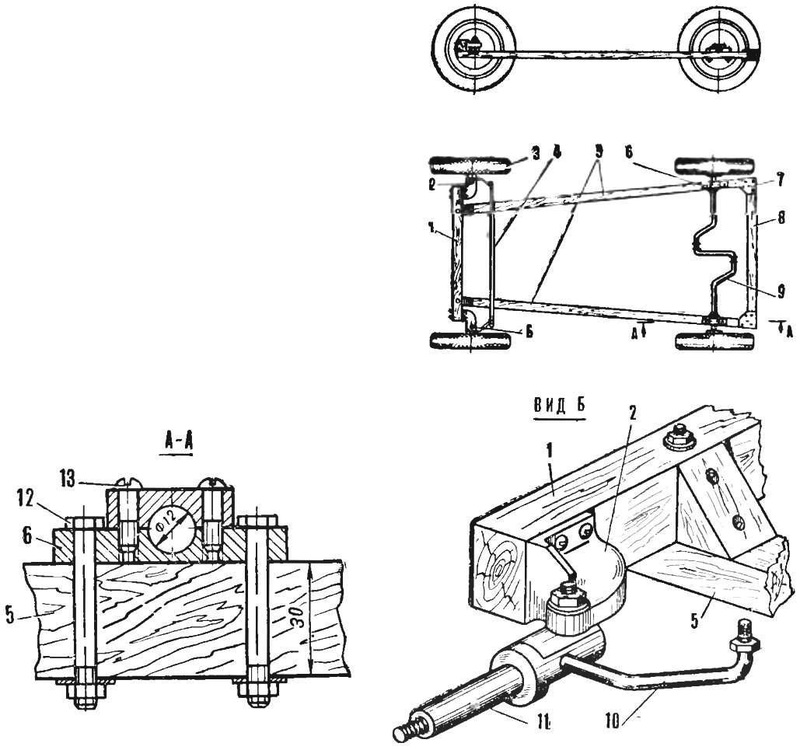 1 — front cross bar (beech 30X40 mm), 2 — bracket of the front axle shafts, 3 — wheel, 4 — transverse thrust steering (dural tube Ø 12×1,5 mm), 5 — longitudinal bars (beech 30X30 mm), 6 — bearing rear axle (bronze, brass), 7 — Klondike solitaire (aluminum, thickness 1.5—2 mm, or plywood, thickness 3-4 mm), 8 — rear cross bar (beech 30X30 mm) 9 — rear crank axle (steel rod Ø 12 mm), 10 — lever pivoting front axle, 11 — front drive axle (steel), 12 — bolt M6, 13 M5 bolt. From a pedagogical point of view, a double machine is also more acceptable, as it allows without harming the ego of the child to fully Express its inherent kindness, sociability, generosity. This machine helps to overcome the stiffness, develops friendliness, facilitates contacts between children. And of course, it is very useful for those who have twins or close in age children as able to accommodate two children aged 3 to 7 years. So, about the design. 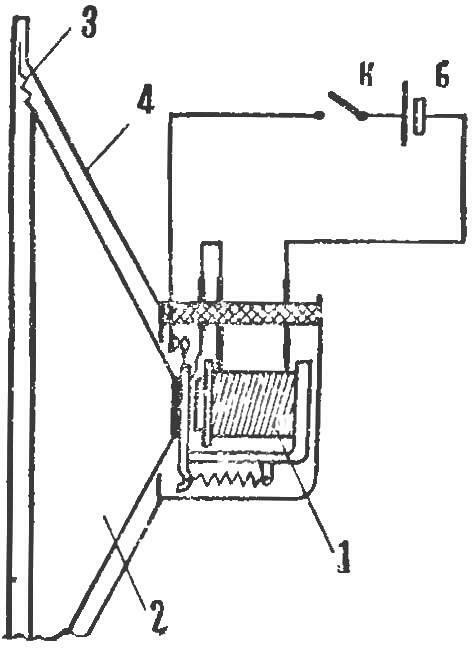 The machine consists of a body and frame. Rama plays the role not so much of the power carrying element, how much elastic suspension. Docking it with the body at three points has allowed to do without any shock absorbers, and operation of “Dreams” over the summer — and she, I assure you, it was a very “cruel” — showed high reliability. The frame consists of four beech bars. In the rear of the frame bars going on glue “in a thorn” and amplified plywood or dural gussets. In the front part — section, with the strengthening of the beech area. All connections promazyvaetsya epoxy resin or casein glue and tightening the M6 bolts. On the upper side of the rear of the frame with M6 bolts are mounted two bearing rear axle, made of bronze or PCB. To the front bar on the bolts and epoxy attached mounting brackets pivoting front axles. 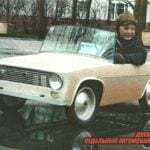 To the car was easy (for pedal car this is very important) and beautiful, the vehicle has vilivalla of fiberglass on the “jerk”. The dummy body can be made of a variety of available materials — plaster, cement, wood. In the home the listed materials (except the last). 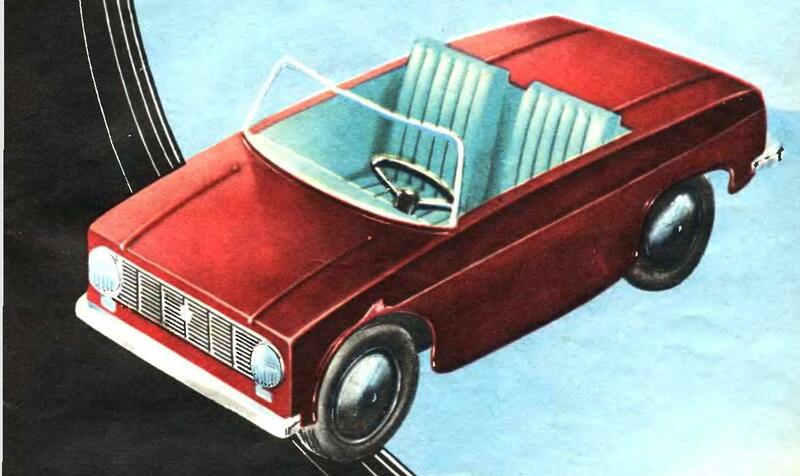 If the car is manufactured at home, the most feasible is samotno-stringer design “fool”. The first stage of manufacture is the drawing of the Plaza. On a sheet of plywood or a large sheet of drawing paper are drawn life-size all the frames of the future design (there should be at least 8-10). At the Plaza of the random boards, the bars are made of frames, and the processing covers only the surface of the outer contour. The elements of the frame (side, top) are joined with plywood gussets on casein glue and screws. The future of the stringers are cut the slots. Frames with stringers going into the frame. After checking the correct installation of its connections promazyvaetsya epoxy or casein glue and, if necessary, amplified by screws. The outer surface of the frame are processed with a plane and rasp. Then frame sheathe plywood (using casein glue and small nails) and uneven sealed with putty or clay. By using clay you can also do all kinds of flanging, stiffeners, corrugations, etc. The dummy is glued newsprint and it is applied to antiadhesive covering, e.g. parquet mastic type “BM” or “Edelvays”. The process of veclachi simple, if you observe the following rules: apply epoxy with a brush as needed to “fool” (the first layer) and the fabric; fluff should be carefully, carefully removing air bubbles and bloating; to ensure that the strips of fabric came to each other for 2-5 cm, and the joints should be placed in different places in order to avoid large local swelling. Curing time of the resin — 4-12 hours, depending on the concentration of the hardener and the ambient temperature. To obtain the necessary thickness of the hull plating enough to stick the 5-8 layers of fabric. In places where you want to strengthen the hull (angles, flanging, locations of future fasteners), glue additional strips of fabric interspersed with the main segments. Then the body is removed from the “fool”. If due to constructional features, the casing cannot be removed, have “fool” to break up and Remove in pieces. The next stage is the production of a working framework (in contrast to the previous technology). According to the existing Plaza are made of two frames, three polosamota and two side stringers. In addition, Harvested Reiki to reinforce the weakest points of the body. After adjustment of elements and a control Assembly (without glue) the frame is glued to the body. Splices must be thoroughly cleaned from the remnants antiadhesive coverage. The elements of the frame apply a layer of epoxy putty (epoxy resin plus filler — talcum powder, tooth powder, blue, etc. 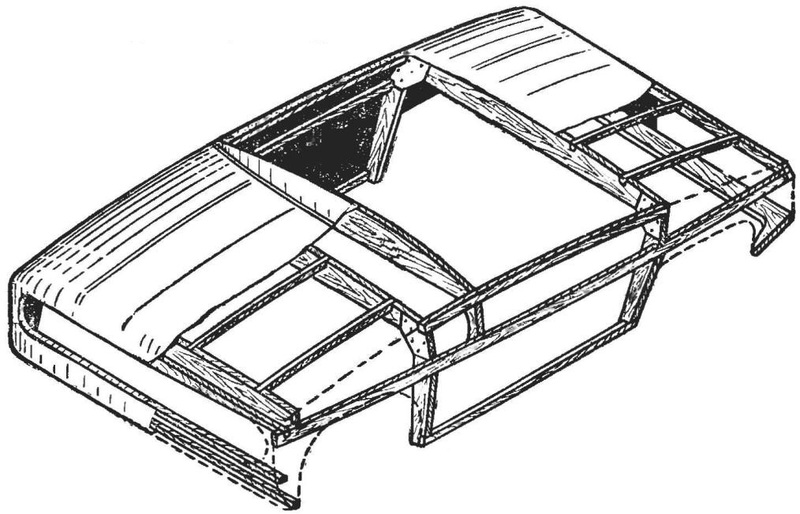 ), and the framework articulates 4 hull with small nails. After curing, the putty surface of the body using the same putty, is brought to the desired purity and smoothness. 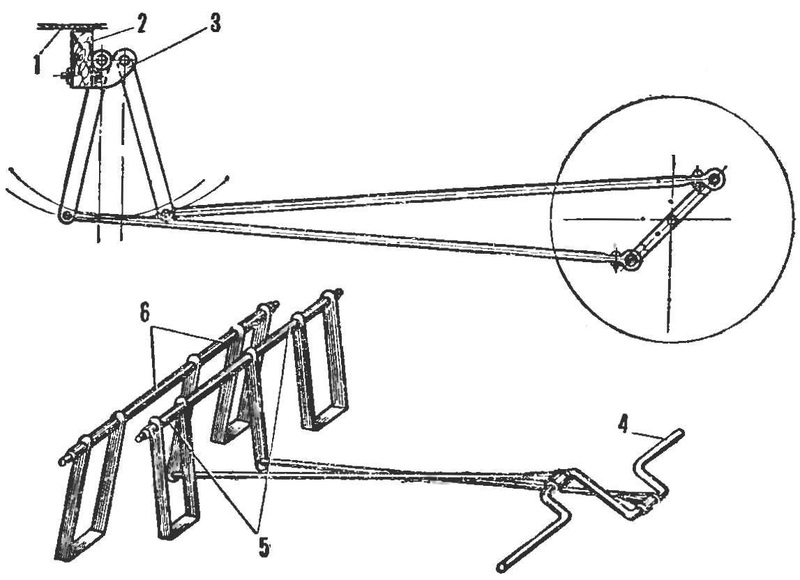 1 — casing, 2 — frame, 3 — bracket, 4 — crank axle, 5 — block right-wing parts, 6 — block of the left pedals. 1 — internal disk (aluminum, thickness 3-4 mm) 2 — M5 screw with nut 3 — sleeve (bronze, brass), 4 — M4 screw with nut, 5 — lid, 6 — camera, 7 — external hard disk — ring (aluminum, thickness 3-4 mm), 8 — M15 bolt with nut, 9 — cover (a plate or bowl out of aluminum), 10 — bushing (aluminum, steel), 11 — tape (aluminum or steel of 0.5 mm), 12 — valve chamber. 1 — relay, 2 — paper diffuser, 3 — a strip of corrugated paper, 4 — metal cone (from the old dynamic loudspeaker), B — battery, To the horn button. To make a wheel at home is quite difficult, it is better to use ready from scooter. If the finished wheel cannot be bought, we advise you to make a homemade simplified construction, using tires from the same scooter. The wheel is made of two aluminum disks — internal and external, while the outer disk has the form of a ring. 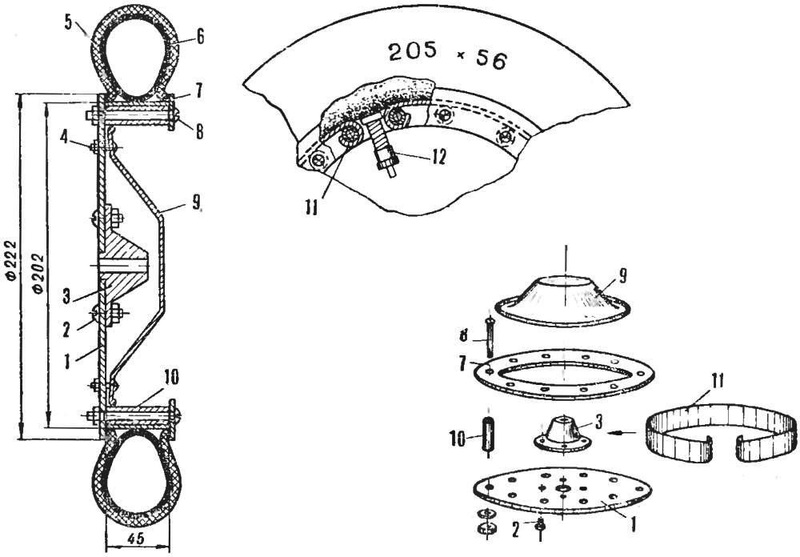 Disc and ring gather with each other by means of M5 bolts and dural or steel bushings. Instead, you can use tubes of appropriate diameter. The circumference describing the surfaces of these bushings, laid steel or duralumin band, fasten two layers of sticky tape. To the internal drive on the M5 bolts fastened with bronze or brass bushing. To simulate the cap is fine aluminum bowl or plate of suitable shape and size. Control — cable. The steering wheel can be made of thin wall aluminum or steel tubing. Steering column, dural tube with an outer Ø of 22 mm. Of great importance to the appearance of the car have all kinds of things — headlights, sidelights, signal, instrument panel, etc. For the child they are extremely important, so such “trifles” it is necessary to pay more attention and show a certain amount of ingenuity and imagination. Lights you can choose ready-made or make yourself. The easiest option is to use a reflector, the glass can be cut from colorless corrugated polystyrene framing made of sheet duralumin. A lattice is easiest to do using a metallized plastic strip, which is stretched on a wooden frame. Quite loud and efficient beep best done with transistors. The schema of such signals at the time were published in magazines “modelist-Konstruktor” and “Radio”. If you are not familiar with transistors, I advise you to use the following construction. Taken the right size and the resistance of the relay coil. His anchor is attached to the cone, glued paper or other heavy paper. Relay is attached to the metal cone (you can use the old case speaker), and the diffuser podklyuchaetsya to the speaker enclosure with four strips of corrugated paper. Relay is switched in bell (via normally closed) mode — the signal is ready. Pitch is adjustable by tightening or loosening the spring relay and tucking contacts. The windscreen can be made from a sheet of organic glass with a thickness of 3-4 mm. Because the machine has sufficiently large dimensions, the windshield is desirable to make removable, then the problem of car storage in the home is somewhat simplified. After reading this article, some readers may question “is it worth it to fuss over a pedal car? 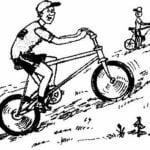 Whether dealing with velomotion or rechargeable…” And I think it is. Even if there is the problem of storage and transportation of the car (try lifting the car with petrol, or worse, with an electric motor, for example, on the third floor), pedal car at first for a child of 3-4 years is irreplaceable. At this age the child is very difficult to focus only on the management machine and in this case it will be a constant danger to others children — because to ride it will have mostly in the Park, on sidewalks, and even the attention of children all around, I guarantee you. By the way, the train is a year or two by car with pedal drive, your child will be able to more painless to master motor and the car will Tell you a secret that I already purchased waldwichtel “D-5” and by next summer I think to alter his “Dream” with a pedal of a drive motor. Machine dimensions fully admit it.